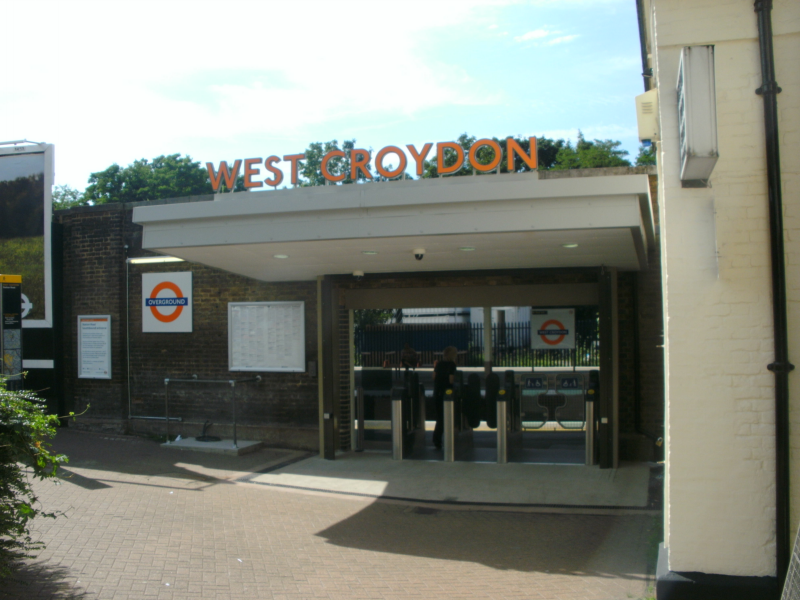 For many years a new entrance to West Croydon station that was more convenient for the tram stop and bus station has been advocated. Although the start of construction had been announced the opening itself seems to have gone unremarked. The entrance is new but it is next to the original station building which, unusually, was built on the down side of the station. The whitewashed wall is part of the original station building. Note that the ticket machine has not yet been installed so if you need a ticket you currently still have to use the old entrance. Also, unless remedial action will be taken, when the new ticket machine is installed it will partially hide the notice giving the times of train departures to specified stations. The entrance is staffed by a single member of staff for the bulk of the day from Monday to Saturday and presumably that member of staff can also attend to platform duties if required. It is not clear why it appears that you cannot simply touch-in on a Sunday. Naturally TfL have been keen to publicise the new entrance locally but one could argue that they are slightly over-zealous. For a start the advantage of its use as an entrance is pretty minimal unless you are catching a train towards Sutton as the distance to walk to platforms 1 and 3 (for trains to London) is roughly the same as using the older entrance on London Road which is still open. 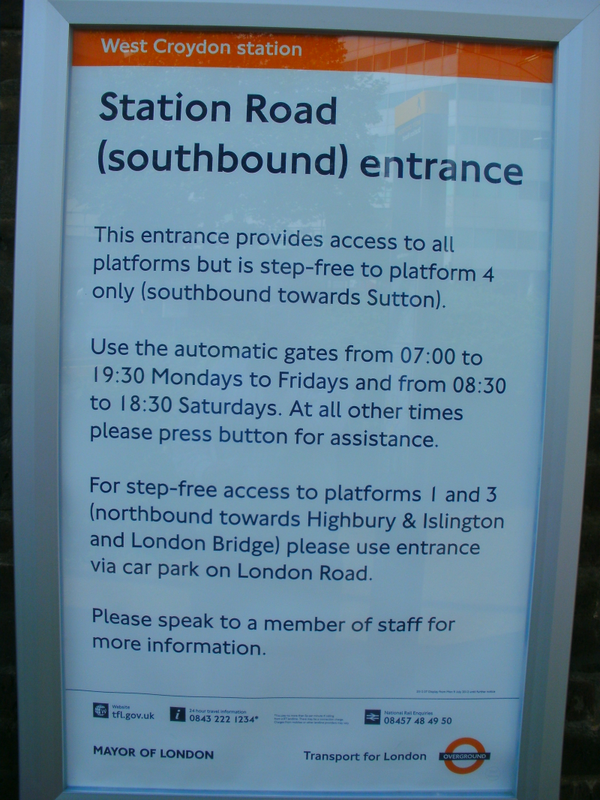 Its real benefit is as an exit from the down platform (platform 4) which is served by both Southern Railway through trains and London Overground terminating trains. The tram stop is only yards away and the bus station is just across the road but unfortunately there is not yet a convenient pedestrian crossing at this point. The Tramlink shelter leaves you in no doubt as to the direction of the station entrance. Unfortunately on the other side of the road the sign makes it clear that the direction of the station entrance is in the opposite direction. This is an easy way to walk from the bus and tram stop to the platform at West Croydon. In the days I lived in Carshalton the nearest railway stations to me were Hackbridge or Croydon. The bus station at West Croydon has just reopened. Only managed a quick look when passing on tram and bus yesterday, but there seem to be no LED displays that show when buses will arrive. For a brand new bus station servicing many routes that seems a shocking omission. The design has canopies but no real weather protection. However, there is a generous amount of seating. Buses that serve Croydon have had their internal passenger information displays augmented with a statement that the new bus station is open. @ Ray L – thanks. Yes I know the bus station has reopened. It was a couple of weeks later than initially suggested but at least it’s done now. I’ve seen some photos. I’m not really convinced about the design in terms of adequate weather protection but TfL is extremely reluctant to build enclosed bus stations these days or to provide full weather protection. I’ve no idea why this is. It is standard TfL practice *not* to install Countdown displays at stops in bus stations. Some have a vertical display unit with a VDU screen – usually near the entrances where passengers will typically enter. We have two at Walthamstow Bus Stn and there is one at Vauxhall. I think someone has said on another forum that WC has one of these units. I’m not much of a fan of these displays as they often don’t display all routes or all departures and are prone to inaccuracy (as is Countdown itself) with buses terminating / standing or where controllers instruct drivers to run oos to regain their timetable. That’s based on trying to use the Walthamstow signs. As I say that’s a system issue and there’s no easy answer to fixing it within the current system design. I don’t believe TfL will ever install any extra Countdown displays – they have refused to do so for years. They may move existing signs between stops or reinstall ones removed during works but they won’t install extra signs at stops. There have been endless Mayor’s Questions on this and the answer has been “no”. Third parties can pay for a VDU to be installed and linked up to the relevant data for places like hospitals, colleges, libraries etc. I think the assumption by TfL is that everyone will use their own phone to access the data at their own cost. No need for any righteous indignation from anyone on this point – it’s just how things are for a wide range of TfL data. 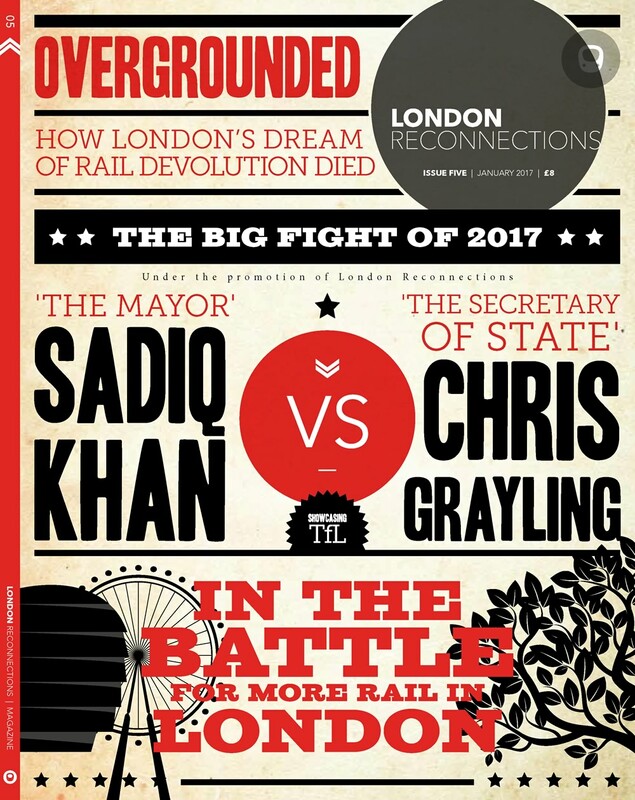 I don’t really like it but I can’t see any change given the budgetary pressures TfL face. Sadly, I fear that they plan not to make unpaid waiting areas too comfortable in order not to attract the wrong type. Unfortunate but I can’t really see a better solution. The real issue with the former bus station (in my opinion) was not really that it was unsuitable for bus travellers but that it attracted “others” who potentially made the experience of catching a bus there less than pleasant. I used to be a big fan of accessing live bus departures from the TfL website on my phone. Having a certain page bookmarked, anywhere in London, one just typed in the five-digit code shown on the stop flag, and the countdown information would appear instantly. However, in recent months, the live bus departures side of the website has been completely changed and is much harder and slower to use, in my opinion. Instead of the five-digit code, I have to type in the stop name and search for it (except the database doesn’t seem to recognise some names, such as that of my local stop), or I can search by route number if I’m waiting for just one route, but the new site seems to have a compatibility problem with my phone and pressing the links sometimes refuses to work, or the page jumps just as I’m pressing it, so that I select the wrong stop, or the wrong direction. It used to be so easy! Not just as accommodation but the environment was slightly threatening as what was going on inside was not always visible from the outside and if a situation started developing that you were not comfortable with then your escape options were limited. Also, Croydon police will tell you that Croydon is a favourite for gangs as it is so easily accessible to get in and get out again. So, if coming by bus, an obvious place to hang around to wait for your mates was the bus station. As always the perceived threat and fear of crime was probably not borne out in the crime statistics but it must have put people off from waiting for a bus there. @ PoP – you are probably correct and, of course, TfL runs 24 hour services at all (?) of its main bus stns so the buildings can’t be closed off. Many cities and towns now have fairly plush bus stns but the lack of evening and night bus services means they can be locked up and not become overnight shelters for the homeless. Putting the question of social policy to one side it does seem unfortunate that bus passengers have to tolerate the cold, howling gales and rain, snow and ice as a consequence. It’s not exactly attractive and a fair number of routes in Croydon are not that frequent in the early mornings or evenings so people may have longish waits. During this period the bus almost invariably arrives and I have been occupied rather than having to wait in frustration for the bus. And of course Countdown never runs out of battery or credit, or gets left at home. What time does this entrance close, please? I keep missing buses because it’s close in the evening or because I don’t know what time it is open until. Don’t want to go all the way there and see it closed. Another reason for the design of the Bus station can be seen if you arrive around 2.45pm onwards on a school day… different groups of school children, groups of young people in black coats with faces obscured, heavy police presence etc.